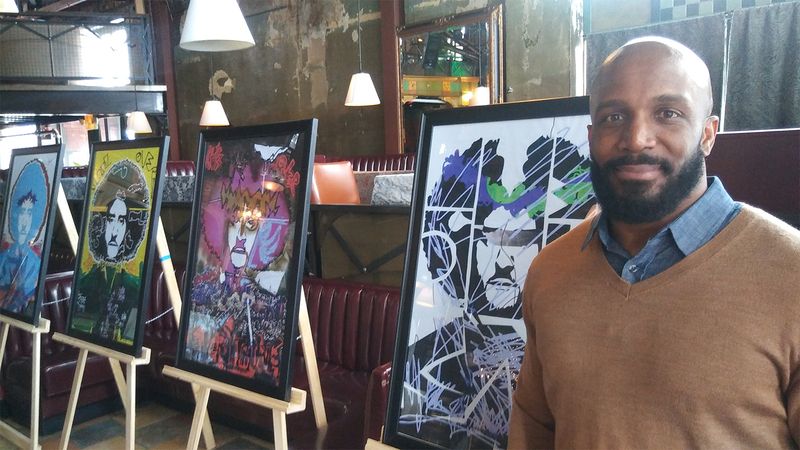 Extremely honored to donate four pieces of art from my personal collection to the NFLPA’s 13th Annual Smocks and Jocks Art Auction and Jazz Brunch. The series behind me, pays homage to Colin Kaepernick and his commitment to speaking up for Black lives in the face of adversity and social pressure. Colin – Love asserts the idea that love is a higher value than conformity, and seeks to instill a sense of hope for a positive destiny. Colin – Natural speaks to the idea that people matter more than money, and encourages us to unplug from beliefs that say otherwise. Colin – Power explores the idea that we should not allow systems to divide us and turn us against one another. When we do, our sense of humanity erodes, violence increases among us, and the systems grow stronger. Colin – Legacy asks how Colin Kaepernick will be remembered historically. As a hero, or something else? We don’t know yet, but those judgments will say at least as much about the society that judges the man, as they will about the man who is willing to take a stand (or in this case, a knee) for something he believes in. The art speaks for itself and opens broader, deeper conversation about humanity.